A list of decades-long of Top 10 Games on the App Store, nobody can’t start without the Australian classic Fruit Ninja. The game released in 2010 by Halfbrick became an instant legend on the App Store. The game still holds the record to the most downloaded app so far. The games therapeutic “splat” owns this success of the game. This game has seen the success like no other game on the App Store. It’s listed as the best selling paid app on the history of App Store. The franchise has expanded to a great extent since its launch on December 2009 by Rovio. This expansion includes 20 sequels, TV series and an animated film. If the nostalgia train hasn’t kicked in yet add this one to this train. Imangi Studios’ Temple run is one of the most addictive game on the App Store. The endless running game has made its name among the top titles of the genre like Super Mario Run and Subway Surfers. 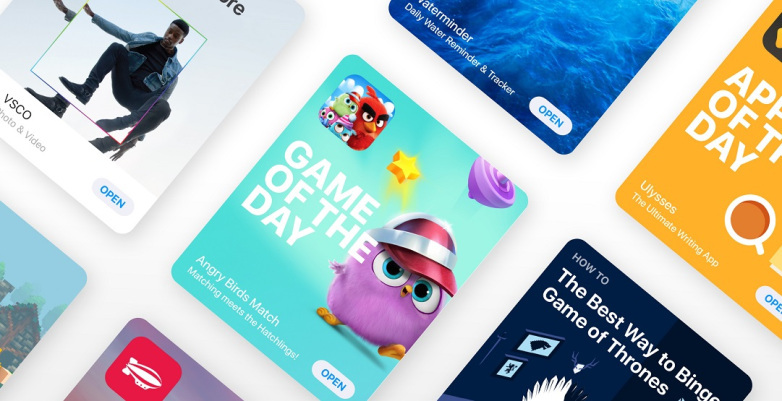 Words With Friends by Newtoy has made the words games popular over the App Store. While the game looks like a twisted version of Scrabble, but still it makes a sweet spot in the user’s heart. This game by OMGPop hit the 20 million download cap in first 5 weeks of its launch on the App Store. This game has its basis on the trend set by Words With Friends having relaxed and on-turn multiplayer features. The game became so popular because of its playability at almost every level of age. If you had been the owner of an iPhone and iPad between 2012 and 2014, then you may have witnessed the dramatic rise and forced fall of Flappy Bird. The game developed by Dong Nguyen became the most popular free downloadable game on App Store in 2014 and just after one month removed by the developer over the guilt of it’s over addiction nature. Hipster Whale’s Crossy Road was developed in Melbourne won an Apple Design Award at WWDC in 2015 and became an essential for its fans. This addictive sliding puzzle game became one of the best Math teachers for children and even the adults. The trick was to give an impression that the game is not training your brain while doing the exact same thing. Zeptolab’s Cut The Rope had been a big sensation for the user in the early days of App Store. Based on a delightfully cute creature named ‘Om Nom’, whose only desire was to eat his candy by solving various levels of challenging puzzles, the game has been downloaded a billion times up till now. The world’s imagination got more realistic by Niantic’s AR Pokemon Go game in 2016 which is why it has been listed in the Top 10 Games on App Store. The game reached about half a billion downloads towards the end of the year. This generated the revenue of about $500 Million, which was the fastest by any game ever. Just like it came the popularity dropped very soon but Niantic is improving it for the loyal fan base.